Choosing a new smartphone can be a dizzying experience with all the attractive options. The first major decision: Apple or Android? Next, it’s a process of striking a balance between your key value priorities and what you can afford, including the top specs and your aesthetic preference. 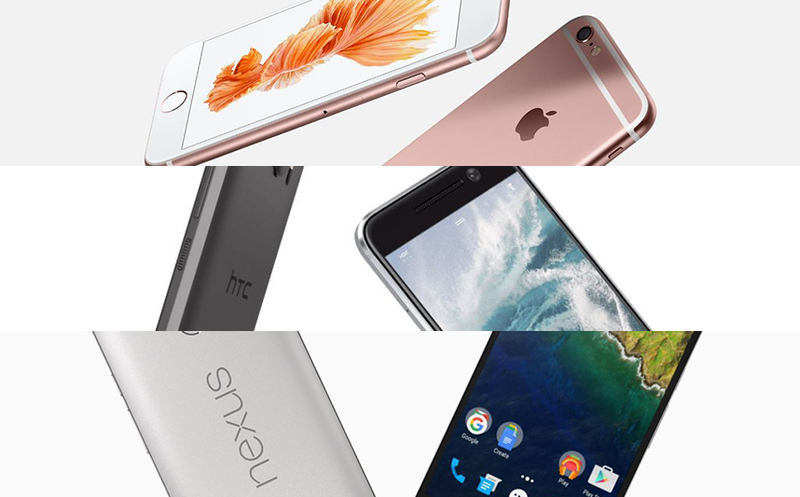 So, to make the smartphone comparison easier for you, here’s our carefully-considered review of the top ten smartphones for June 2016. For those that like plenty of room to play with, this third generation Moto X is a large 5.7-inch screen and a battery of equal capacity. To tick off another smartphone essential, it also includes an impressive 21-megapixel camera and comes complete with front-mounted speakers for optimum sound. Moto X Style Pure Edition released in September 2015. Combining top-of-the-line quality with probably the most budget-friendly price in our top ten, the solid metal Honor 5X has all the latest gadgets (fingerprint scanners and high screen resolution to match the iPhone 6) and a respectable 13-megapixel camera. For those that don’t want to compromise on specs but can’t afford to break the bank, this is a reliable option. The Huawei Honor 5X might just be the best-looking affordable unlocked phone you can buy. First in the Galaxy Note line-up is the ultra-chic Note 5. Made with metal and glass and featuring a hefty 5.7-inch screen complete with curved sides for easy handling, the specs are also exciting. But beware photo hoarders: this model lacks the capacity to add external memory, although there is free cloud storage. The Samsung Galaxy Note 5 comes with a stylus for easier function. While everyone else was creating bigger and bigger screens, Apple decided to offer its loyal users something smaller. Its latest and greatest, the iPhone SE, features a 4 -inch screen. It’s everything you expect from an iPhone: the latest processor, sleek design and a 12-megapixel camera – all in a nifty palm-sized design. The Apple iPhone SE is the most compact design in our top ten. One of the most recent releases in our top ten, the Galaxy S7 comes with all the latest advancements and has been aesthetically updated in a subtle 5.1-inch glass screen with smooth, curved edges. Additionally, it’s waterproof, can measure your heart rate, offers wireless charging and has microSD support to fulfill all your storage needs. The Samsung Galaxy S7 was released in March 2016. Its high-end price reflects the complex technology used to create the seriously sleek design and larger screen. The Galaxy S7 edge is essentially the same smartphone as #6, just much fresher and more beautiful with melded 3D glass for a modern, curved-screen finish. Its exceptional camera with lightning-like focusing makes snapping your favorite pics easier than ever while the quad-core processor makes navigation quick and easy. The Samsung Galaxy S7 edge was released in April 2016. Another popular release, the iPhone 6s stepped up the game of its predecessor with faster and more intelligent software, fingerprint scanning, a 12-megapixel camera and even some light waterproofing. Boasting more aluminum where it mattered to improve phone durability, the 6s’s most impressive technological enhancement is the addition of 3D Touch, which senses how much pressure you apply to the display. The Apple iPhone 6s has increased battery life. It might not be the most attractive smartphone on our countdown, but remember it’s what’s inside that matters. Boasting front-facing speakers, Google’s Nexus 6P is quickly becoming one of the most technologically advanced phones on the market. With a 12-megapixel camera, speedy fingerprint sensor, the newest Android software and high-res screen, this reasonably priced phone made by Huawei provides real value. The Google Nexus 6P is manufactured by Huawei. While not as popular as Samsung or Apple, HTC has put its brand back on the map with the HTC 10. With an ample 5.2-inch screen, 12-megapixel camera, extremely high screen resolution, dual speakers, fingerprint scanner and sleek collection of color scheme options, this smartphone has the latest technology with beautiful design to match. HTC 10 launched in April 2016. Making our list because of its nearly tablet sized 5.5 -inch screen, the 6s Plus boasts exceptional quality in every area. New software including a better camera, quicker processor, 3D Touch display, in addition to its strengthened glass screen, are all just some of the benefits. The supersized device also works seamlessly in landscape mode and is perfect for using with a Bluetooth keyboard if you so choose! The Apple iPhone 6s Plus comes in 4 color options: silver, gold, space gray and rose gold. Whichever smartphone road you follow, just remember to shop via DubLi.com’s extensive selection of electronic stores to earn Cash Back while you shop. You might even earn enough Cash Back to splurge on some accessories for your new device!